The American Heart Association and the American College of Cardiology redefined what is considered high blood pressure (HBP) in November 2017, based on new evidence supporting a lower threshold. 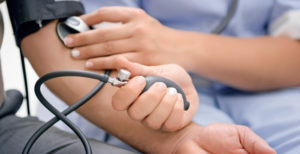 Stage 1 high blood pressure, also known as hypertension 1, is consistently measured at 130 over 80 or greater. The previous threshold was 140 over 90. HBP is a serious condition that, if left untreated, can lead to coronary heart disease, heart failure, stroke, kidney failure and other health problems. Under these new guidelines, nearly 46 percent of American adults are considered to have high blood pressure. Over one-third of Americans would be recommended for high blood pressure medication. HBP is referred to as the “silent killer” because those who have it don’t typically experience symptoms. The best way to find out if you have HBP is to get your blood pressure checked every two years and speak with your doctor. In some cases, HBP can be prevented by living a healthy lifestyle that includes exercising regularly, eating a healthy diet low in salt, fat and alcohol, avoiding smoking and managing stress. For more information about your personal situation, speak with your doctor. Employers may contact Employee Plans for additional workplace support.